Rady Children's Hospital teenage cancer patients and survivors celebrated prom Friday. 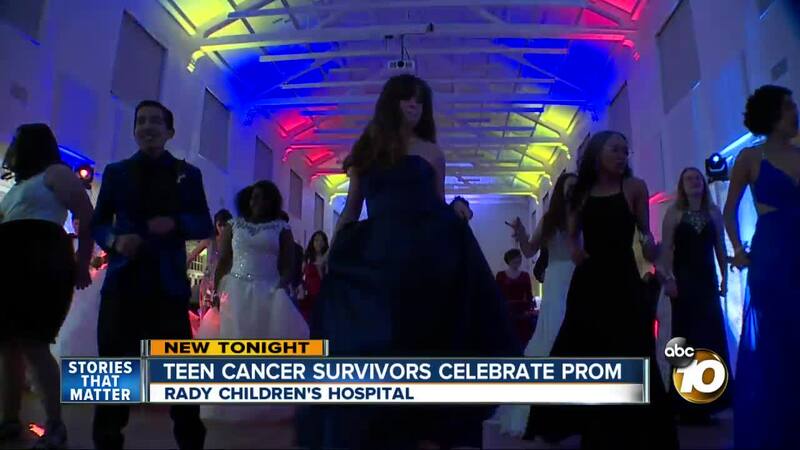 SAN DIEGO (KGTV) — Teenage cancer survivors from Rady Chidlren's Hospital celebrated an "unforgettable" event. The annual Unforgettable Prom brought teens battling cancer out for a night of dancing and celebration — a night many of the teens miss at school while they continue to fight illness. Now in its 13th year, the dance has helped teens take a moment to celebrate that special night in every teenager's life. And everything is covered: From dresses and tuxedos to entertainment, food, and decor, thanks to volunteers and the Friends of Scott Foundation, a local non-profit that works to provide emotional and financial support for children with cancer and their families. This year's theme, Avengers "Age of Heroes," honors Ryan Wilcox, a former patient and Unforgettable Prom King, who lost hist battle with cancer. "Unforgettable Prom" was started by Carmen Delgadillo, founder of the Friends of Scott Foundation. Degadillo lost her teenage son, Scott, to Acute Lymphostic Leukemia. From that loss, Delgadillo started the foundation to help other families in need of support during their own battles with cancer. To learn more about the foundation, click here . 10News reporter Mackenzie Maynard emceed this year's event at Liberty Station.